A new survey of primarily corporate communications professionals identified the hottest trends and tactics in PR – and perhaps those that aren’t so hot too. Respondents said storytelling, content marketing and thought leadership will be more important over the next 12 months. The survey was conducted by yours truly and in collaboration with Ned Lundquist, an IABC Fellow, and the community of communicators he’s built over the last 18 years or so. Ned is a retired senior naval officer who launched the “Job of the Week” (JOTW) email newsletter in 2001 as a free resource for PR pros looking for work. Today his newsletter has 5,500 active readers and as the survey demographics show – many are senior PR professionals in corporate communications roles. The survey was conducted in February 2018 and 155 respondents completed the questionnaire. 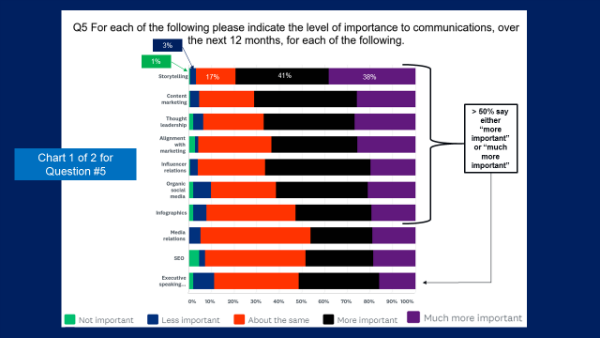 The full report – the 2018 JOTW Communications Survey – was announced in today’s issue of the JOTW and is freely available on SlideShare (also embedded nearby). While the survey covers a broad range of concerns in PR – the findings on trends and tactics are of a keen personal interest to me. Specifically, the survey found storytelling, content marketing and thought leadership topped the list of more than 20 tactics or trends related to PR in terms of importance. Thought leadership and the ability to communicate through effective stories – challenge, tension, climax and denouement – are classic elements in traditional public relations. I’m especially fond of the graphic Lou Hoffman used to illustrate these elements here. 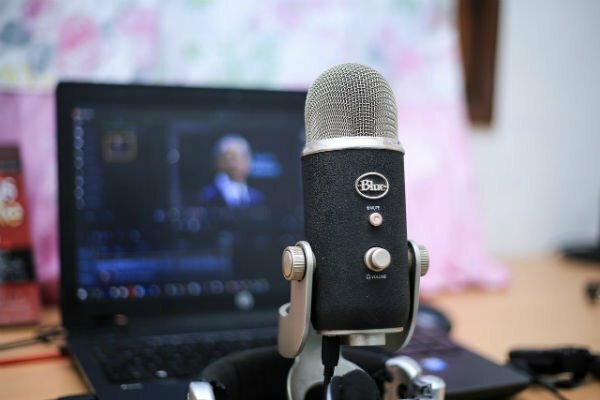 Content marketing, which is distinctly different than marketing content, is still an evolving new trend that naturally aligns with the PR profession given their work with editorial contacts. As regular readers know, I’m prone to say, PR is the best-kept secret in content marketing. Additional trends or tactics where 50% or more of respondents said they’d be more or much more important included: alignment with marketing, influencer relations, organic social media, infographics, and executive speaking. 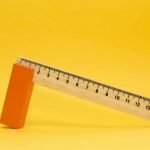 Executive speaking strikes me as a back-to-basics approach – and one that’s sorely needed after many years of chasing shiny new social media objects. Hints at Cooling Tools and Tactics? 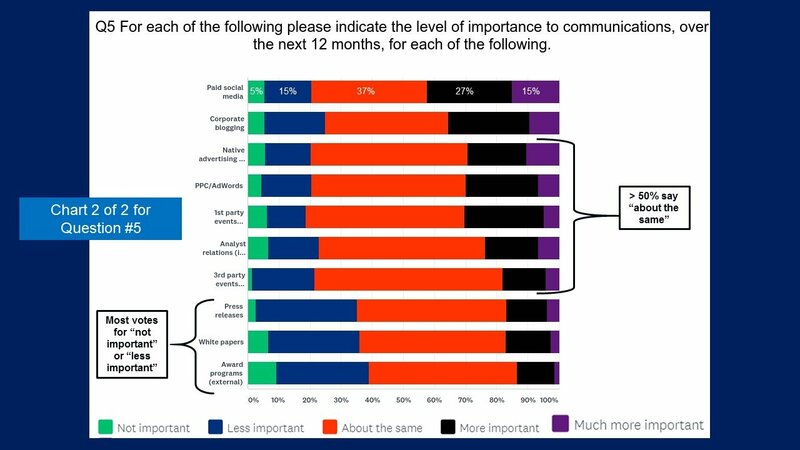 Several trends or tactics will be no more or less important in the next year, according to 50% or more of respondents. These included: native ads, PPC, analyst relations and both first and third-party events. It’s worth pointing out tactics like PPC and native ads tend to be less central to the typical PR professional’s role. However, those that grow skills in these areas stand to make themselves more valuable to their organization. While no trend or tactic earned 50% or more of the votes for “less important” or “much less important” in the next 12 months, there are three that earned more than the others. Those were press releases (34%), white papers (35%) and award programs (39%). Interestingly, a separate study of 400 in-house creatives and marketers by inMotionNow* put award programs at bottom of the list of results that matter. Perhaps it takes three to make a trend, but that’s two substantive studies of primarily client-side professionals downplaying industry awards. For any agency – marketing, advertising, PR, creative or otherwise – the message behind the data is pretty clear: clients value results not your awards. With regard to press releases, a sure-fire way to stir up debate in PR is to call the press release dead – some in our industry have traced these claims all the way back to the 1970s. While I don’t think these are “dead” — press releases just aren’t as useful as they once were for several reasons. In the near future, I’m going to dedicate an entire post to this topic and share some additional data, observations and anecdotes. PR is like mission impossible. The biggest obstacle in PR is financial – 63% cited budget as their top challenge, even as 57% point to an ever-expanding list of duties. At the same time, more than half (54%) said proving value or ROI of communications to the business. Top reasons to hire or fire a PR agency. When corporate communications hires an outside agency, most (54%) said they do it because they need an extra pair of hands. When communications agencies are fired, the top reasons can be traced to cost (79%). Media relations is getting harder. A majority (51%) of respondents believe media relations is getting harder, about one-third (32%) say it’s about the same and just 3% think it’s easier. The rest are unsure. Organic social media is getting harder too. Most (50%) respondents say organic social media is getting harder; 19% say it’s about the same; 5% say it’s easier and 26% are unsure. I believe social media is mostly a paid channel. Top tech tools used by PR pros. The five tools communications professions say they use the most are: 78% web analytics; 75% social media management; 66% press release distribution; 66% media monitoring; and 50% content management systems. Affordable tools I recommend and on which I have published product reviews — include NewsAI and Ahrefs. PR pros fully employed but open to moving. While the PR Week salary survey recently reported just 15% of PR pros say they changed jobs in the last 12 months that might change substantially in 2018: more than half of respondents (55%) to the JOTW survey reported being fully employed but open to new opportunities. Whether you are looking for your next gig or are seeking to fill a position with a talented communicator, you should start by reading Ned’s JOTW. You can subscribe for free by emailing him at lundquist989@cs.com. The full report is freely available on SlideShare and is fairly quick read. You are welcome to use the data or slides, but like Creative Commons, please share and share alike, and including attribution to Ned’s JOTW. * Disclosure: inMotionNow is a Sword and the Script Media, LLC client. I’ve referenced that survey because I believe it was solid research and the results are relevant to this analysis and not because the company is a client.